251 years passed since my ancestors Beil /Peil arrived in Russia, accepting the invitation of Catherine II (Catherine the Great of Russia). Manifestos of 1762 and 1763. 1. Jakob Joseph Peil (Якоб Иозиф Пайль, ca.1738, cath., farmer from Bitsch, Lothringen, France). Spouse: Anna Franziska (Анна Франсиска ...), ca. 1736. Arrived in Louis (Otrogovka), Saratov District, Russia 14.6.1766. Son — Peter Peil. 2. Peter Beil (Петер Байль, ca. 1772. Married and moved to Seelmann (Rownoje) in 1802. Died in 1823. Spouse: Anna Margaretha Fashing (Анна Маргарета Фашинг) ca. 1783. Son – Christopher Beil. 3. Christopher Beil (Христофер Байль), 12.04.1812. Spouse: Anna Maria Seewald (Анна Мария Зевальд), 1818. Son – Adam Beil. 4. Johann Adam Beil (Иоганн Адам Байль) 06. 06. 1848. Spouse: Anna Margaretha Weber (Анна Маргарета Вебер, ca. 1850), Marriage: 15.11.1865. Died 1916. Son –Andreas Beil. 5. Andreas Beil (Андреас Байль), 1876. Spouse: Elisabeth Rau (Элизабет Рау), 1885. Marriage: 07.11.1903. Daughter – Wilchelmina Beil (Вильхельмина Байль, 1918, my mother). 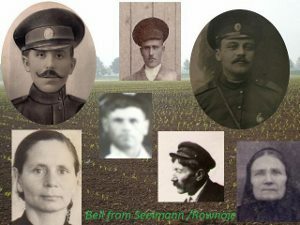 My mother Wilchelmina Beil was born in Seelmann (Rownoje), Saratov District, Russia. Her parents were Andreas Beil and Elisabeth Rau. 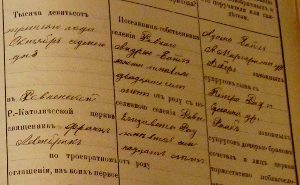 The marriage record of Andreas Beil and Elisabeth Rau (in Russian). It is listed there that Andreas Beil (27 years old) and Elisabeth Rau (17 years old) married 07.10.1903. Their marriage took place in Roman Catholic Church, Rownoje, Russia. His parents: Adam Beil and Anna Margaretha Weber. Her parents: Peter Rau and Susanna Raab. The clergy was Löwenbrück, Franz (Левенбрик Франц). Ровное. 15.11.1865. Адам Бейл, юноша, 18 лет и Анна Маргарета Вебер, девица, 17 лет. родители жениха: Христофeр Бейл и Мария Зеевальд. родители невесты: Иван Вебер и Маргарета Шпехт. (15.11.1865. Rownoje. Adam Beil, 18 years old and Anna Margaretha Weber, 17 years old. His parents: Christopher Beil and Maria Sewald. Her parents: Johann Weber and Margaretha Specht). 06.06. 1848. Rownoje. Johann Adam Beil. His parents: Christopher Beil and Anna Maria Sewald. His godparents: Johann Adam Weis and Anna Margaretha Paul. Census record of 1857, Seelmann (Rownoje), Russia. (in Russian). (Перепись населения 1857, Зельманн (Ровное). Хозяйство 39 (в 1850) -52 (в 1857). Христоф Бейль 38 (в 1850) — 45 (в 1857). Христофа жена Анна Мария 39 (в 1857). Его дочь Анна Маргарета 5 (в 1857). 1. Иоганнес 8 (в 1850), умер в 1852. 2. Якоб 4 (в 1850) – 11 (в 1857). 3. Адам 2 (в 1850) – 9 (в 1857). 4. Михаил 1 (в 1850) – 7 (в 1857). (Census Record 1857 of Seelmann (Rownoje). Household 39- 52. Christoph Beil 38 (in 1850) – 45 (in 1857); Christoph’s spouse Anna Maria 39 (in 1857); his daughter Anna Margareth 5 (in 1857). His sons: Johannes 8 (in 1850), died in 1852; Jacob 4 (in 1850) – 11 (in 1857); Adam 2 (in 1850) – 9 (in 1857); Michael 1 (in 1850) – 7 (in 1857). It is written there that on the 12 of April 1812 was baptized Christophorus (born on the 9 April of the same month), the legitimate son of Peter Beil and Anna Margareta Bailin from Rownoje. …. .
Census record of 1811, Seelmann (Rownoje), Russia. (in Russian). Only males. (Ревизская сказка 1811, Зельманн (Ровное). Хозяйство 13. Только лица мужского пола. Мартин Фашинг 39 (по 1798 году) – 52 (по 1811 году). Дети его: Михаель 9 лет, Иоганн Георг 4 года. Петер Байль (перешёл из колонии Отроговка в 1802 году. 39 лет (по 1811 году). Иоганнес Шефер (перешёл из колонии Красно...(не очень понятно) в 1804 году. 28 лет (по 1811 году). Иоганнеса сын Августин 4 года. (Martin Fasching 39 (in 1798) – 52 (in 1811); His children: Michael 9 years old and Johann Georg 4 years old. His sons-in-law: Peter Beil, from colony of Otrogovka in 1802, 39 years old (1772) and Johannes Shäfer, from Krasno…. In 1804, 28 years old. The son of Johannes – Augustin 4 years old. Sm 13. Fasching Martin h 39, Susanna Kloch, sp 22 from Preuss, Anna Margaretha d 15, daughter by his deceased wife, Anna d 13, daughter by his deceased wife, Magdalena d 11, daughter by his deceased wife, Julianna d 7, daughter by his deceased wife. Source: Brent Alan Mai, " Census of the German Colonies along the Volga... " Volume 1 and 2. 1.Christoph Beil (12.04. 1812). Spouse: Anna Maria Seewald 1818. Her parents: Karl Seewald, 1784 and Anna Maria 1786. 2.Anna Beil 1823 (27 – in 1850). husband: Christoph Heindel (Гейндель) 1821. 3.Anna Maria Beil 1808 (42 – in 1850). Husband: Christoph Dulhen (Дульэн/Дульзен) 1799. Karte der deutschen Mutterkolonien Wolgagebiet. Bearbeitet: Dr. K. Stumpp. 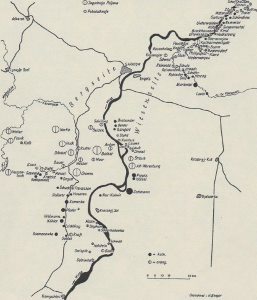 (the map of the German colonies in the Volga region, Russia Edited: Dr. K. Stumpp). There was no family of Beil in the colony of Otrogovka (another name Louis) in 1767, but there was a family of Peil there. Haushalt 45. Peil Joseph, 28, kath, Ackerbauer aus Lothringen, Bitsch. Frau: Anna Franziska, 30. In der Kolonie eingetroffen am 14.6.1766. (household 45. Peil Joseph, 28, cath. Farmer from Lothringen, Bitsch. Spouse Anna Franziska, 30. In the colony arrived on the 14.6.1766). In 1788 Joseph Beil /Peil and his famiy moved to colony of Franzosen (other name of the colony: Rossoshi). By that time Jacob Joseph Beil /Peil and his wife Anna Franziska had 2 sons (Joseph ca. 1768, Peter ca. 1772) and 2 daughters (Elisabeth ca.1769, Maria Eva ca. 1772). Louis. Mv1574. 1788 Joseph Beil and family moved to Franzosen. Source: Brent Alan Mai. “1798 Census of the German Colonies along the Volga”. Band 1-2. Census record of 1798, Franzosen (Rossoshi). Household 11. Anna Franziska Biel h (hostess) 58, widow, deceased husband Jakob Joseph Biel. Joseph Biel s (son) 30, Father: Jakob Joseph Biel. Anna Maria Schwerdt dl (daughter- in –law) 25, from Semenovka. Johannes gs (grandson) 3; Maria Eva gd (granddaughter) 2; Elisabeth gd (granddaughter) 3 mon. Peter Biel s (son) 26, Father: Jakob Joseph Biel; Peter is working in Husaren. Household 20. Johann Leonhardt h 38 from Degott. Elisabeth Biel sp (spouse) 29 from Louis. Children: Christoph 3 and Anna Maria 1. Franzosen (Rossoshi). Mv0658. 1797. Maria Eva, daughter of Joseph Beil, married Schipper in Neu-Kolonie. They lived in Franzosen (Rossoshi) for 10 years and then in 1799 decided to return to Louis (Otrogovka). 739 2650. Дело о переходе колониста Бейля из колонии Россоши в колонию Отроговка. 17.12.1799. (The case of the colonist Beil’s movement from the colony of Rossoshi (Franzosen) to the colony of Otrogovka (Louis). 17.12.1799). The information was taken from the census records of colonies: Louis (1767), Franzosen (1798), Seelmann (1798, 1811 ... ), birth and marriage records from Seelmann. It was sufficiant for me to make Beil Family Tree (my mother's side).